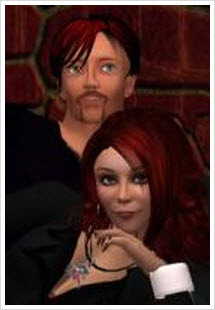 Killion Slade is comprised of a married writing team who met in the virtual realms of Second Life and virtually enjoy everything. Mrs. Slade crafts & writes their stories, while Mr. Slade concentrates on publishing. Members of the Horrors Writers Association and the Paranormal Romance Guild, they storyboard their characters inside Second Life as their avatars reveal their stories. Killion’s published short stories can be found in Sirens Call, The Danse Macabre, Cynic Magazine, Bewildering Stories, Midwest Literary Magazine and in the anthologies Bite from the Heart, Death Sparkles and the upcoming anthologies The Ghoul Saloon from Static Movement and Roms, Bombs, and Zoms from Evil Girlfriend Media. Mrs. Slade was the winner of the 2012 Wicked Women Writers Award for “Children of Angels” short story podcast from Horror Addicts. Killion has found a new love of turning the written word into an audio podcast auralgasm. Killion’s Current Project: A continuation of the paranormal horror thriller in the World of Blood series, where Cheyenne O’Cuinn faces down vampire to human decisions as she confronts loss time and time again. The real world is threatening nuclear annihilation at every corner of the globe. What can she do to help support her family, survive the devastating losses, and find her way in this new reality. Their second novel in the World of Blood series, Obfuscate, is planned for Spring 2015. 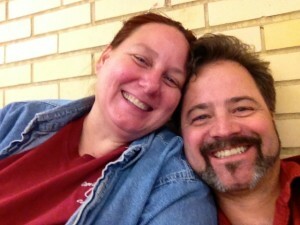 We enjoy our marriage, family, friends, pets, cooking, funny people, monsters, places & things which go bump in the night or day. (Even creepier sometimes) We want to hear about them. We want to write about them, and most of all, we want to share what other writers are saying about them. We hope you’ll join us on our journey!